Sustainable Furnishings Council celebrates use of our world’s most abundant natural resource – our garbage! Making use of what is thrown “away” will get us far in building the new products we need, including furnishings for our homes. You can participate in the reclamation and the reduction of waste in a variety of ways, all of which will enhance your home’s beauty and enrich the welcome it presents. Thinking of “recycled”, you might think first of paper and plastic products, but reclaimed and recycled woods are significant in furnishings. Highest profile these days are urban salvaged wood and reclaimed deconstructed woods, both areas that represent segments of the wood products market that are growing quickly. More and more old buildings are being demolished carefully so that the materials can be reused. More and more fallen trees are being salvaged so that the wood, gnarled and splintered though it may be, can be used for a higher purpose. According the EPA’s annual report, Municipal Solid Waste Generation, Recycling, and Disposal in the United States: Facts and Figures for 2012, wood represented 8% of our landfilled waste, after what had been recovered for recycling. Durable goods like furniture represented 20% of our discards, and none of that was recovered. This situation persists in spite of a nearly 10 fold increase in recovery through recycling at US municipal landfills since 1960. The obvious result is that we as consumers are responsible for choosing AND disposing of furnishings responsibly. Ultimately, we are the ones to take responsibility for what the EPA calls “Sustainable Materials Management” as we choose products that will last us a long time, and as we choose to dispose of what is no longer useful in a way that allows the material to be reused. Fortunately we are being offered more and more choices. Nearly every community has a Habitat for Humanity ReStore, or other charity retailer accepting donations of gently used furniture and reselling them to benefit a good cause. While only reclaimed furniture is sold in these outlets, these days most furniture stores offer collections made of recycled or reclaimed wood. Where is it reclaimed from? That is a very important question. It might come from abandoned and dilapidated buildings – barns, homes, factories that have long ago reached the end of their useful life. Or it may come from trees salvaged when roads are widened or when storms come through causing damage. Systems for rating the eco-friendliness and energy efficiency of our buildings, such as LEED, give credit for materials that are recycled, and for local sourcing, lending credence to the significance of furnishings made locally of locally reclaimed materials. Fortunately, more and more local makers are hip to the fact and finding materials locally, making use of dilapidated structures and “road kill” to provide us with extraordinary and storied new designs. Among Sustainable Furnishings Council members, Tucker Robbins is a leader in this innovation. Others, however, are also producing beautiful furniture from reclaimed and recycled materials, including Cisco Brothers, Phillips Collection, Asian Art Imports, etc. And what is the significance of these manufacturers’ choices? In reclaiming, recycling ,and upcycling, these designers are keeping CO2 sequestered. Obviously, if you are using materials already harvested, you are not causing the destruction of precious ecosystems or exerting pressure for overharvesting of new wood resources. 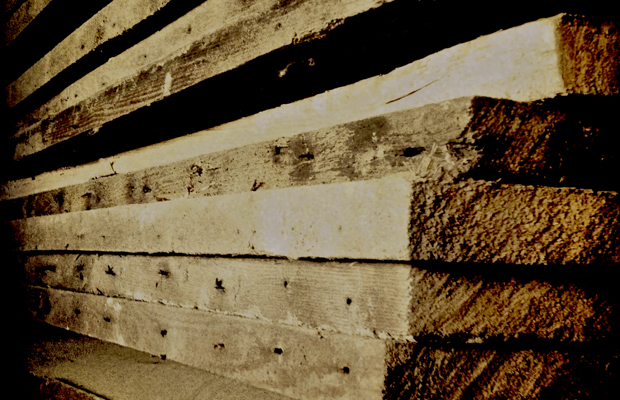 BUT, with the popularity of reclaimed woods growing, there are more and more fake reclaimed woods on the market, so the discerning consumer does well to ask about the origin of the woods they are buying. Rainforest Alliance and Forest Stewardship Council have even developed standards for certifying that reclaimed wood, is in fact legitimately reclaimed, and not just falsely aged to look like it spent decades or centuries serving another purpose. Discerning consumers will find a wonderful array of storied materials on offer, including logs recovered from our waterways by such companies as Triton Logging. Remember that in the old days logs were floated down river to the saw mill? Some logs inevitably sank. These days, smart recovery workers such as Triton are pulling these well-preserved and beautifully aged logs out of rivers and lakes and making the lumber available to furniture makers and builders. There is also furniture made in your own community from felled or windfallen trees that might otherwise have gone to landfill. Companies such as Robin Wade salvage lumber from windfall as well as trees that are being removed by public works. Their creativity sequesters carbon, reduces landfill volume, and provides homemakers with storied pieces that can be used and enjoyed for generations. Other urban salvage comes from the demolition of buildings that have become dilapidated and unsafe. You will find beautiful offerings in now-rare woods such as Douglas Fir from Urban Woods, thanks to their ability to salvage what is still usable from deconstructed theaters and warehouses from along the California coast. In the case of a now-rare wood, utilizing reclaimed material is the only way to have the pleasure of having these woods in our homes. Reusing and recycling wood is an economical and richly storied way to dynamic new looks. Many SFC member companies can share the importance and the fun of their success in creating the most beautiful products and interiors with the world’s most plentiful natural resource. Shop these resources with pride! Susan Inglis has directed the Sustainable Furnishings Council since its incorporation in 2007. Her work there is dedicated to promoting healthy environments inside and outside, providing the most comprehensive information on environmental, safety and health issues in the industry and championing initiatives that improve products and processes. The SFC and its qualifying members respond to environmental and social issues and offer specific information to consumers, the media and other partners.